Here at Dell World 2012, there was a lively discussion about BYOD, BYOx, and mobility this morning. What's the difference between BYOD vs. BYOx? Well, the "x" in BYOx represents applications, content, and other elements that go beyond the device. In other words, enterprise applications can be available on any device through robust cloud-based platforms. 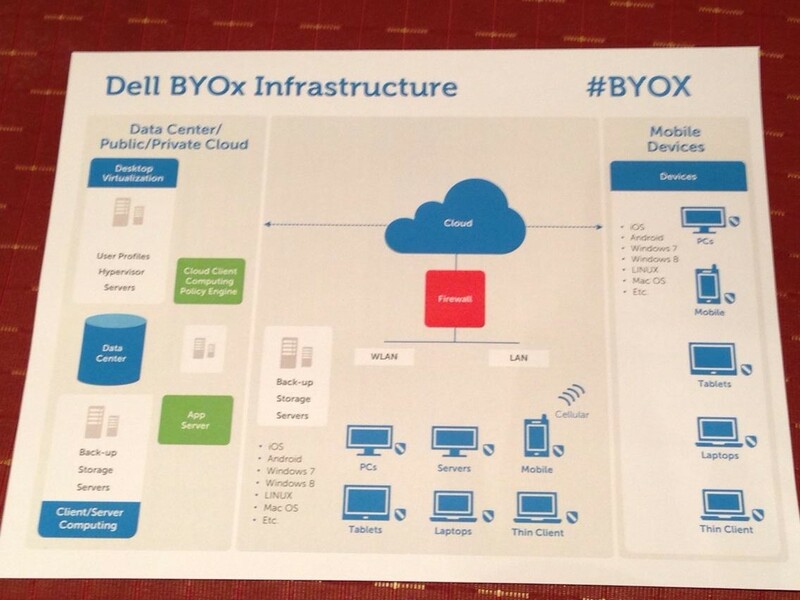 So, there are overlapping themes between BYOD and BYOx, but they're not the same. We all know that we're seeing so many mobile devices entering the workplace. Mobile operating systems like iOS and Android are becoming ubiquitous in the medical workplace. I speak with physicians and medical students all the time who want to know how they can use their personal mobile device in the healthcare setting without risking security breaches around patient privacy. They're using their personal smartphones to take photos of patient rashes. They're using their iPads for remote desktop access to their office PCs running an EHR. College grads today have grown up with the Internet throughout their entire lives. Generation Y, also known as the Millennial Generation, represent the mobile generation. Over $7 million of lost mobile phones are lost each day (the actual $ is probably actually bigger). What type of corporate data breach do these lost phones represent? Today's employees are accessing personal and corporate files on their own devices. What's the risk associated with this type of behavior when you mix personal and corporate cloud-based services? It's troubling that many organizations don't have mobile device policies in place today. This is especially true when you look at small medical practices, private medical offices, and even multi-specialty medical groups. Doctors, nurses, and students are all bringing their own devices into the medical workplace. They're accessing files in the corporate cloud as well as in their personal cloud (personal content). Dell Wyse PocketCloud is an example of a personal cloud solution. The Dell Kace K3000 Mobile Management Appliance is an example of a mobile device solution that delivers robust features and capabilities. Here at Dell World, these solutions will be showcased on the exhibit floor. Dell's approach to BYOD involves 3 key elements: 1) Define; 2) Protect; and 3) Empower while having a solid foundation that supports the evolving workforce.